The founders of The Coast FM are major market professionals who came to Mendocino County to do Real Radio. The call letters left behind by some of the Coast Crew include legends of West Coast Rock; stations like KMPX, KSAN, KLOS, KMEL, KFOG and KLSX. 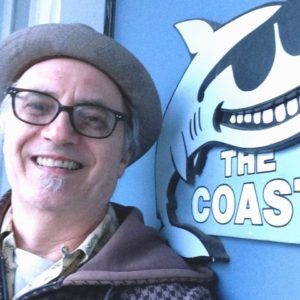 Our morning show on The Coast FM features the “Dean of Mendocino County News Directors.” Joe Regelski is a veteran of San Francisco radio, including KMEL, KNBR, THE QUAKE and THE CITY. Joe is the only local newsperson to cover all the important governmental and civic meetings, presenting factual, timely accounts of all the events of importance to our audience. Mendocino County native Dred Scott started his career in Marin and Sonoma counties at KTIM and KVRE, respectively. He’s done two multi-year stints at KFOG/San Francisco, and worked at the former Live-105 in SF, 91X in San Diego and 100.3 The Sound and KLSX in Los Angeles. He loves hiking the Coastal Trail, discovering new music, practicing yoga and bonding with Endo the Cat. And he’s happy to be hanging out at The Coast FM. Kate Hayes, middays on The Coast FM , is a nationally known voice and a veteran programmer and air personality at stations in San Francisco, Los Angeles and more: KSAN, KKCY-THE CITY, KQPT-THE POINT, KTIM, KLSX and others. Kate is also a two-time Marconi Award finalists for Small Market Personality of the year. In 2008, Kate was nominated as FMQB Triple A Music Director of The Year for Markets 51+ for helping to pick the newer music you’re learning to love. Nights on The Coast FM belong to co-owner, Tom Yates. His dry wit and musical knowledge come from his long history in radio and major market successes, including as first Program Director of KLOS, plus programming KMPX,KSAN, KKCY-THE CITY and KLSX, and working as a national consultant. The nightly specials and Tom’s own “LOCAL LICKS” program keep listeners to the wee hours. Tom also hosts “Breakfast with the Beatles”, the longest running Beatles show in Northern California, Sunday Mornings at 8am. Hugh Connolly now covers afternoons on The Coast FM. Hugh has previous media experience at KCCN in Monterey; AFN – Armed Forces Network in Frankfurt, Germany in the early 90s; college radio and DJ’g. We feel he’s going to be great listening on your ride home. You may also see Hugh out and about playing music and DJ’g local events with his wife, Jamie. Hosting Sunday evenings on The Coast FM plus occasional fill-ins is station co-owner Vicky Watts. Vicky also handles the day to day business side of things for the station and, as manager of kozt.com front page and a member of many service organizations and community groups, brings information and a special awareness of events and happenings to the rest of the Coast Crew and her listeners. She’s also Mom to our mascot, CD The Coast Dog , who joins her in the studio. Jamie Peters Connolly Having spent years with The Coast FM as an account manager, Jamie can now also be heard Sunday afternoons. No stranger to radio, Jamie worked for KPIX FM, KNEW/KSAN and KDFC in San Francisco in the 90s. A local musician, Jamie sings along with her husband, Hugh and you’re bound to find her emceeing local events. Sarah Haye Many years with The Coast FM on Mornings and then after the birth of her child, afternoons. She’s an extremely valuable back up for vacation coverage. Joe Seta has been with The Coast FM for years, handling Monday Nights and Sunday Mornings plus voicing various commercials. Joe’s now filling in when needed. Sam Russell who runs us all and the office at The Coast FM has been at many of the same Los Angeles (KPPC, KPFK, KMET, KLOS, KLSX) and San Francisco (KSFX, KKCY) stations as Tom, Kate and Joe Regelski. Sam brought her major market Public Service experience to the Coast Crew and to kozt.com, as well as her skills as a live event producer. She is vital for our remote broadcasts from parades and other community happenings. Rick Bondor made the Mendocino Coast his home in 1979. He moved here to work in radio and has expanded his media skills. He has developed expertise working in sales in Radio, Newspaper, and Direct Delivery. Rick is a great asset to The Coast FM and can be for one for your business, too. Jamie Peters Connolly – Has come back to The Coast FM after being the Winesong Event Director. Sold Radio for us for many years before that and it’s great to have her back as a sales rep who also writes and produces radio commercial for her clients. We also have to mention our Engineer, Bill Rett…. if it weren’t for him, we wouldn’t be here. And he wouldn’t be here if it wasn’t for the music. He says that The Coast FM is the last of the Real Radio Stations. The Coast FM is Real Radio …. programmed by long time professionals and hosted by people who just love music.